It is not surprising that these three feed off one another, and make up the bulk of assessment in the typical mathematics classroom (including my own). While I have been known to slaughter a few of the sacred cows of the instructional process, I have lagged severely behind in my attention to assessment. I value the complexities of learning that occur when student ideas encounter perturbations, curiosities, and other conceptualizations. The type of assessment that comes out of these mathematical encounters is rich, connected, and constantly evolving. Assessment compacts this complexity into tiny chunks. 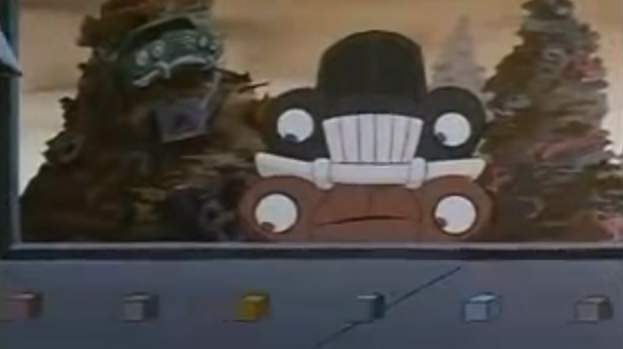 My mind wanders to this scene from The Brave Little Toaster (a childhood fav) where the cars are compacted into tiny cubes by a vindictive magnet and junkyard trash compactor. Exams are not worthless, but are impersonal and static. I’ve employed the review day as a sort of buffer between the two. Class tasks are used to enact mathematics in a connected ecology, and the exam is designed to separate and operate on a static set of knowledge. The review day is a transition where we call upon the anchor activities of the first stage to perform well on the exam. Students typically complete questions from a textbook. The room loses life, and I hate it. The following are two activities I recently used in a unit with Grade 11s on Unit Analysis and Scale Factor. The goal was to discover a hybridity between the (en)active nature of knowledge formation and procedural fluency often needed for the exam. While I’m sure they are developed from the influence of others, I can say for sure that the second activity is adapted directly from Kate Nowak‘s “Speed Dating“. She has many other promising review activities on her blog. Before students came into the class, I printed four typical questions from the unit and taped them to the whiteboards around my room. (I have a front, side, and back wall boards). The students were told to solve each problem with as many people as they wanted. I did not assign groups, or even mandate them. I wanted it to be free-flowing. At each station, I placed a simple table with three gradations of difficulty. I gave each student a marker, and asked to them to self-assess the difficulty of the problem when they completed it. The result was a quick tally of which types of questions are giving the class the most trouble. The nice part about this activity was the free-flowing nature. If a student was stuck on a particular station, two or three new waves of help would arrive and share their perspectives and guidance. Students used the whiteboard space around the problems to solve them, but I asked them to erase solutions before leaving so everyone could have a blank slate. This was simple to set up, and allowed for a large amount of time to de-brief, discuss solution paths, and ask follow-up questions. It enhanced repetitive practice with peer conversations and problem analysis. I wrote 12 ridiculous questions regarding scale factor and unit analysis, and labeled them all with an astrological sign. (We always joke about pseudo context in my room, so the questions are designed to purposefully poke fun at the textbook’s attempt to be “real world” and “relevant”). Each student was given a problem to complete and become an expert on. I gave 15 minutes at the end of class to make sure each student was confident in their own solution for the next day. They were told that they are responsible for explaining their process on a series of speed dates the following day. I arranged tables in a row and set a timer for 4 minutes. Students then had two minutes each to read and explain their problem to their date. As the activity progressed, they got so fluent with the explanations, that the timer was reduced to 2.5 minutes. It wasn’t long before every student had seen the 11 other problems. I sat in on certain dates and helped students who were a little more reserved find partners. As the activity wore on, some claimed they had “dated” everyone necessary, and I set them up as a third wheel on a date involving two problems I considered particularly important. I feel that while I am still looking for a way to honour the complexities of an (inter)active community of learners on summative assessments, a better use of the sacred review day is a start.